Have you ever polished off all the vegetables that you bought at the market with no waste and nothing thrown out? It rarely happen to me as I am an over-exuberant market shopper. I also forget that I sometimes go out, leaving the contents of my fridge and pantry to wait another day. But I did it on Sunday! Polishing off 8 ears of corn, and the last of the zucchini in the bottom of the crisper! Go me! 1. Bring a pot of salted water to boil. When it starts to boil, add the penne. It should take about ten minutes to cook. 2. After you add the penne to the water, heat the olive oil over medium heat in a large skillet until it begins to shimmer. Add the zucchini. Cook it until it is browned and caramelized on all sides. Right before the penne is done, add as many red chili pepper flakes as you like. 3. 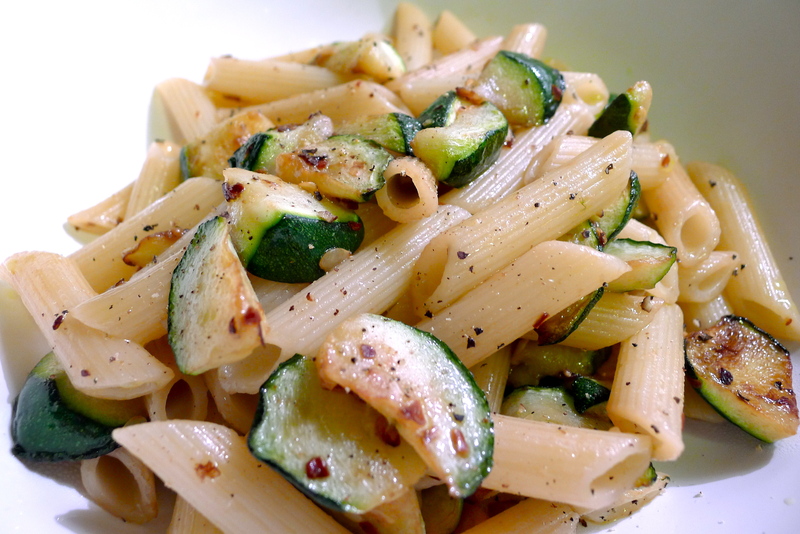 Using a slotted spoon, scoop the penne directly into the skillet with the zucchini. Stir everything together to combine, scraping up the fond at the bottom of the pan. There should have been enough pasta water clinging to the penne that you don’t need to add anymore to the pan. If you find the pasta is looking a little dry, add some more pasta water from the pot. Adjust the seasoning, but be aware that the Pecorino will add saltiness as well. 4. Divide the pasta into two bowls. Squeeze one half of a lemon over each portion. Top with cheese and serve immediately.